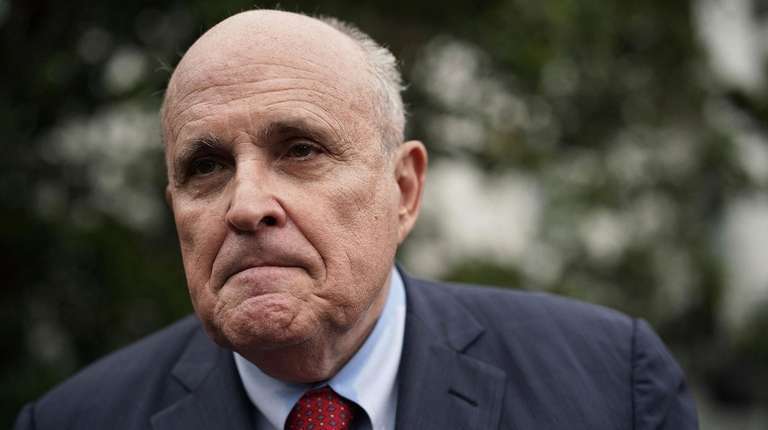 Rudy Giuliani remarked on NBC's "Meet the Press" Sunday regarding his role as Donald Trump's lead lawyer that "I just came into it in April, which now seems like two years ago, but it's less than a year." It's been long enough for patterns to become familiar, including the "So what?" approach to damage control when Trump's stories fall apart. That was Giuliani's spin in May, for example, when he revealed that Trump had reimbursed Michael Cohen, his ex-lawyer and fixer, for the $130,000 hush-money payment to Stormy Daniels — meaning that the president had lied when he previous denied it. "Perfectly legal," Giuliani said. A month later, while reiterating Trump's "No collusion!" mantra on the Russia investigation, Giuliani added a "besides" argument: “Collusion is not a crime.” Trump apparently liked that so much he tweeted it: "Collusion is not a crime, but that doesn’t matter because there was No Collusion." Whether that line of defense helps Trump is debatable, but Giuliani went there again Sunday amid questions about the circumstances behind Cohen's false testimony to Congress that Trump's pursuit of a real estate project in Moscow ended in January 2016. Special counsel Robert Mueller's office has said there were inaccuracies in a BuzzFeed report Thursday that it had collected evidence that Trump told Cohen to lie. Left unclear was whether Trump and Cohen talked before the testimony. Giuliani dug deeper. In his TV appearances and to The New York Times, Giuliani also said Trump was involved in discussions for a Trump Tower in Moscow through the entire 2016 campaign, a longer and more significant role than previously acknowledged. Trump repeatedly claimed during the campaign, while pushing for friendlier relations with Moscow, that he had "no deals," "no business" and "nothing to with Russia." In November, after a previous revelation about campaign-year Russia dealings, Trump said, “There was a good chance that I wouldn’t have won, in which case I would have gotten back into the business, and why should I lose lots of opportunities?” Shorter version: So what? Trump managed to anger the hardest hard-liners on immigration with his offer to add a temporary reprieve for immigrants at risk of deportation if he gets his $5.7 billion in border wall funding, but Democrats aren't biting. The partial government shutdown enters its 31st day Monday. "800,000 Americans are going without pay," House Speaker Nancy Pelosi tweeted. "Reopen the government, let workers get their paychecks and then we can discuss how we can come together to protect the border. #EndTheShutdown". Trump accused Pelosi of acting "irrationally." He added, apropos of nothing, "And by the way, clean up the streets in San Francisco, they are disgusting!" Trump also vaguely dangled the possibility of offering amnesty to nearly 11 million immigrants living in the country without legal status as part of future legislative negotiations, a prospect that is at odds with his long-standing calls for stricter immigration enforcement. Senate Majority Leader Mitch McConnell has said he will schedule a vote on the plan this week. For more, see Newsday's story by Laura Figueroa Hernandez. The unscheduled absence rate at TSA rose to 8% Saturday — nearly triple the norm — causing more checkpoint closures at major airports, The Wall Street Journal reported. The agency has said workers going without pay are reporting that they are unable to continue coming in to work as financial pressures mount. Trump's Pentagon speech last week on the Missile Defense Review presented what sounded like a laudable goal in theory, writes Newsday's Dan Janison. "Our goal is simple: to ensure that we can detect and destroy any missile launched against the United States — anywhere, any time, any place," Trump said. But the technology isn't there yet. Neither is the money. And critics say it will do more to upset nuclear stability than make Americans safer. Trump administration officials are planning for the president's second summit with North Korean leader Kim Jong Un to take place in Vietnam, Bloomberg News reported. The likeliest site is Hanoi, the capital, but Danang and Ho Chi Minh City in the country’s south have also been discussed as possibilities for the talks. The White House announced on Friday that Trump would meet Kim in late February on the U.S. effort to get North Korea to denuclearize. Though that result remains far from assured, Trump sent a self-congratulatory tweet Sunday: "The Media is not giving us credit for the tremendous progress we have made with North Korea. Think of where we were at the end of the Obama Administration compared to now." In toto, Pompeo prefers Kansas? Secretary of State Mike Pompeo — Trump's point man on diplomacy with North Korea, among other hot spots — is considering leaving the administration to run for a U.S. Senate seat from Kansas that is opening up in 2020. Majority Leader Mitch McConnell is aggressively seeking to recruit Pompeo to defend a Republican seat in a state where Democrats made gains in November, The Washington Post reported. The incumbent, Pat Roberts, recently announced he is retiring. Pompeo served three terms in the House from a Wichita-area district before joining the Trump administration as CIA director. Losing Pompeo would be a blow to Trump, who considered him a trade up from his first secretary of state, Rex Tillerson. Sen. Kamala Harris announced she's seeking the Democratic nomination for president next year. The 54-year-old California Democrat is the state's former attorney general. She took the public plunge early Monday on ABC's "Good Morning America." Her #MeToo advocacy is part of Sen. Kirsten Gillibrand's 2020 pitch, but the New York Democrat is also having mea culpa moments explaining past conservative stands on immigration issues that "certainly weren’t empathetic and they were not kind." See Newsday's story by Scott Eidler on Gillibrand's Sunday talk show appearances. Vice President Mike Pence made a ripple on MLK Day by saying both Trump and Martin Luther King Jr. inspired change. Sunday marked Trump's second anniversary in office — the halfway point of his term — with the shutdown further exposing his shortcomings as a dealmaker, The Washington Post writes. Politico reports that Trump talks to Rep. Mark Meadows (R-N.C.), the leader of the House Freedom Caucus, more often than many of his senior aides, and Meadows was a key figure in persuading Trump to take the hard line that triggered the shutdown. Press secretary Sarah Huckabee Sanders hasn't held a briefing since Dec. 18.